Michelle, the owner and creator of Digiments (digital sentiments) has decided to give away a weekly FREE Digiment! Then, if you create a card with the Digiment you will be entered to win the next ENTIRE new release! How awesome is that! If you don't win, or if you see a Digiment you really like, they only cost $1.00 each~and you can resize them which I LOVE! Absolutely beautiful card! Ribbon is so pretty! And the sentiment ie a real truth! Love your card girl! Those colors are awesome! 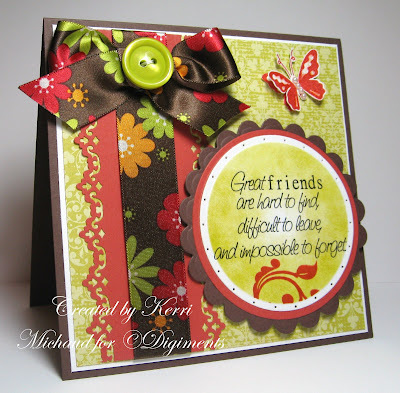 Seriously, I think that is my most favoritest card you have ever made - and not because my Digiment is on there ;) I love these colors...the ribbon...the border punch....oh man this is a great great card, Kerri! This is stunning! Those colors on the ribbon are so pretty, and I love the swirl on the bottom of the digiment, and the gorgeous butterfly! This is a great card! Gorgeous. Love the rich vibrant colors and what a wonderful layout. Super pretty. Beautiful card! I can see how you would draw your inspiration from that ribbon, very pretty! I also love how you framed the digiment! This card is so eye catching! That ribbon is beautiful and the whole thing looks wonderful.